This week teams from Marine Reach Medical and Marine Reach Training are preparing to fly to Vanuatu for a number of targeted outreach opportunities. Anticipation is high as we enter this tiny nation of only 250,000 people spread across 83 islands, covering some 650 nautical miles. As always the island people are so loving and appreciative of every gift and act of service we bring. Yes, outreaches have continued these three years without a ship. However, NOW that we have the new ship, M/V PACIFIC HOPE, we look forward to 2014 and extending our impact bringing more people, resources, and services. During the months of October and November, these land-based teams will be performing dental work, optometry examinations, ophthalmology surgeries as well as screening for future eye operations. Students from our Discipleship School (DTS) will assist the medical teams on Tanna Island. Our students will also help with ongoing construction and ministry at the newest YWAM base outside Port Vila (V2Life Base) and share the love of Christ everywhere they go. Advance work teams will be assessing locations for future medical, educational, and community development projects. It is with God’s love that we enter this nation and spread out over two specific islands. Back in Tauranga, the refit work has begun in earnest aboard the PACIFIC HOPE. We have ‘gutted’ the area for the future medical clinic and plans are being made for the next steps to get the Pacific Hope ready for service in the islands. Not only the Clinic area needs work, but the galley and mess hall, CO2 room which affords fire protection in the unlikely event of an emergency, and last but certainly not least, our sewage system needs upgrading! We know there will be challenges and sacrifices in the days ahead, and we also acknowledge that God has launched us on a journey of faith and perseverance...ever aware of the Lord being concerned for the character and Christ-like-ness He builds in us. Daily we must remind ourselves of Hebrews 11:1: Faith is the assurance of things hoped for, the conviction of things not seen. I would like to thank you for your generous support and faithfulness in helping us acquire this new vessel to the Islands, the Pacific Hope. Would you respond to this Nehemiah call and help us begin the journey of transformation. Let it start in our hearts…let us be assured that this hope we carry will produce not only medical results, but also fruit of eternal value. 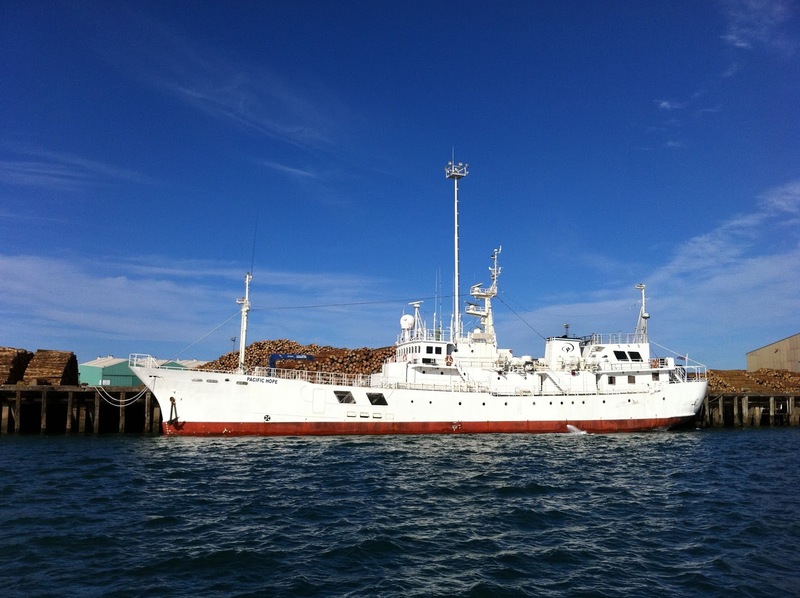 If you are able we invite you to come to Tauranga, visit the Pacific Hope, and be part of the journey of rebuilding our (YOUR) ship and sharing her with God’s people in the islands.